Brand new machine, Grinder, Knock box, Britta water filter and starter kit and full Caffe Agust merchandising kit. It won't let you down, coffee will taste great, service is included. and a free service visit every 9 months. Positive Cash flow: No large capital outlay - Makes profit from Day 1 . No Servicing Costs: Servicing every 6-9 months is included. 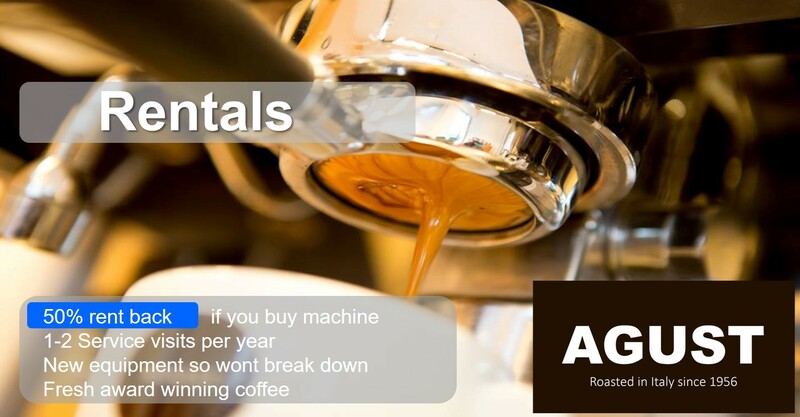 Get a brand new machine every 2 years: You can avail of a new coffee machine every 2 years. This eliminates unforeseen headaches and keeps coffee quality at its optimum. Tax advantages: Payments are fully off settable as a tax deduction in the year they are paid.